The Esk War Memorial was originally erected in memory of those who served in World War One. 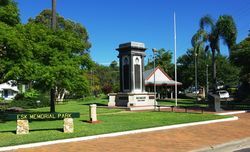 In 1988 some of the lettering on the World War One memorial was restored, and two plaques commemorating Australian sacrifice in post-1945 conflicts were affixed. In 1991 another plaque was attached, honouring those who fell in World War Two. The foundation stone was laid by Colonel Graham Butler, who was the original Medical Officer with the Queensland 9th Battalion, landing with them on Gallipoli. His Kilcoy family later donated a Butler Medal. This was awarded to the surviving 94 men of the 9th who were on Gallipoli from the original landing on 25th April 1915 for at least six continuous months to 25th October 1915. 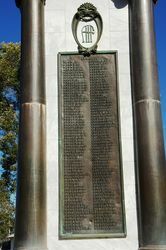 In 1992 a plaque was added to the Esk memorial paying tribute to the 2/11th Australian Army Field Regiment who returned from the Middle East in 1942. They camped at Coominya and Woodford before being moved to Darwin. The foundation stone of the Esk Shire Soldiers' Memorial was laid in position on the 30th November 1920 by Dr Graham Butler D.S.O. The base of the memorial is almost completed. Mr. E.F. Lord in introducing Dr. Butler said that the memorial would cost about £800 about which £550 had been subscribed locally and about £150 by the Camp Drafting Association. The memorial was unveiled by General L.C.Wilson C.B., C.M.G., C.S.O., on the 27th August 1921. The Brisbane Courier, 2nd December 1920, 1st September 1921.